The Maryknoll building seems to have an envelope of quiet majesty about it. Looking at the building from the front steps, one gets a sense of the dedication of the many souls that have toiled for God’s mission over the decades. It is a testament of God’s continuing reward on the unwavering resolve of Fr. James Walsh and Fr. Thomas Price. As part of my formation program, I have spent three months living here at the Knoll. I travelled to Maryknoll from Chicago in the middle of May, 2017. These past few months have been enriching in a variety of ways. I have encountered the spirituality of Maryknoll as it is expressed by Maryknollers who have spent decades overseas. Towards this end, the dining hall at the Knoll has been an important place. I recall many conversations on a variety of topics. A few particularly polemical ones with a very amiable Maryknoller served to broaden my perspective on mission. Through innumerable anecdotes offered by seasoned missioners, I grew in my appreciation of the history of Maryknoll. The love for mission at the Knoll is broad and deep. Though advanced in years, the zeal and zest for all things missionary among the men I met is evident. There is an enduring love for the people among whom the missioners worked. I find this admirable. I got to visit with Maryknollers living in Mission St. Teresa’s. It was wonderful meeting men like Fr. Art Willie whom I had heard about before beginning the formation program. Eager to share their mission stories with me, I could see why it is said that ‘old is gold’. God willing, I will emulate the generosity and patience I have witnessed at Mission St. Teresa’s. This is both in the senior missioners and their caretakers. 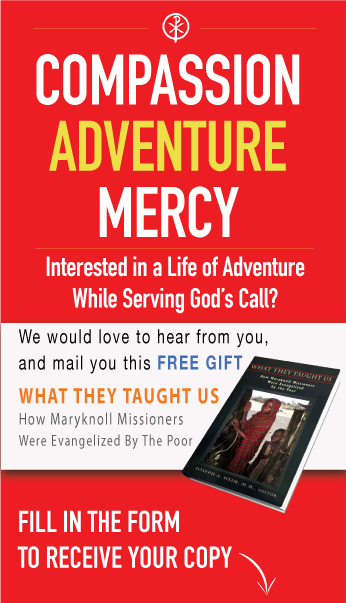 The story of Maryknoll is embedded in all that one encounters here at the Knoll. From the buildings to the people who have worked here since the early beginnings of the Catholic Foreign Mission Society of America. From these, I once again got to appreciate the immense gift that mission is. Sites and sights at Maryknoll contribute to an appreciation of the single-minded zeal that contributed to the furthering of God’s presence and accompaniment in the universal Church. There were many communal events during these past few months. Beginning with an ordination ceremony in the month of May, I had the joy of participating in the numerous activities here at the Knoll. Foundation day on June 29th, with accompanying Jubilee celebrations, was an opportune moment to witness God’s faithfulness to Maryknoll. These activities and the other numerous encounters I have had here at the Knoll complement my formation program in Chicago. Visiting the Knoll has served to deepen my understanding of Maryknoll’s history as well as share in a glimpse of its future. Previous Post Meet Father Peter Latouf, M.M. Next Post The Grunt Priest, Father Vincent Capodanno, M.M.